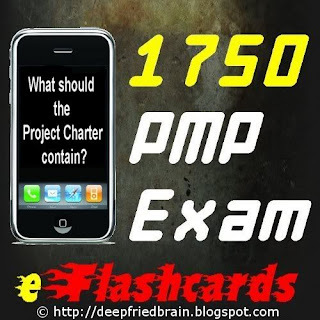 PMP Exam eFlashCards is a PMP Exam Prep tool that was launched in Apr’09. On my request, the publishers had sent me a free evaluation copy for review, before the launch. The review had been on my to-do list for a while. Finally, this week I managed to find some time to review the tool. I’ve tried to keep the review very simple. It has 4 parts - Product Facts, Pros, Cons and Conclusion. So, let’s get started. eFlashCards can be used on a computer or "any" modern device like iPod, iPhone, Blackberry, Treo and most "smart phones"
Quality of content: Coming from a trustworthy instructor like Mr. Cornelius Fichner (PMP), the information is clear, precise and highly reliable. Comprehensive Material: Very thorough coverage of PMP Exam topics. It has separate set of cards for each Knowledge Area, Abbreviations, PMBOK Glossary and ITTOs. 167 flashcards specifically covering the ITTOs. Remembering the ITTOs is one of the major headaches for PMP aspirants and this tool can help you in that area. Note: The ITTO flashcards are included as a bonus. So, the total number of flashcards is 1917 (= 1500 + 167). Low cost: You pay about $30 for 1917 cards. It comes to about 1.5 cents per card. Compared to other similar products, it's the cheapest. You can find a detailed price comparison table on the product page. Simple Installation (or rather no installation): Simply unzip the downloaded package into a folder and you are up and running. All you need is a simple image viewer that comes pre-installed on all operating systems. No additional software (such as Java or Flash player) is required. Compatibility: It works on your PCs, smart phones and media players like iPhone, iPod, Blackberry, Treo, Zune, etc. The ITTO flashcards are a real bonus. The email course is not as comprehensive as you might think. It basically gives you an overview of each knowledge area. It comes in the form of an email a-day for 10 days (total 10 emails). The forums are a good way to directly interact with Mr. Fichtner. He personally answers the questions posted in the forums. But, if you have already purchased any of the other products by OSP International (such as PM Prepcast, PMP Formula Study Guide or the PM Study Coach), then you already have access to the forums. In that case, it's not really a bonus for you. Clear Product Description: One thing I really appreciate about all the tools from OSP International is the clear description of the product. Not only do they highlight the product features, but also disclose the limitations of the product. As a buyer, that gives us lot of confidence in the product. Money-back guarantee: If you are not satisfied with the tool for any reason, simply ask for a full refund of your amount. No questions asked. And this is no gimmick. Each folder contains the same set of 1917 flashcards, but the order of flashcards is different in each folder. Basically, it tries to simulate the shuffling effect by providing a different order of the cards in the 3 folders, though there's no real shuffling. That's why they are called "pre-shuffled" cards. I would prefer a proper application, which provides a truly random shuffling of cards. Altogether, there are 3 * 1917 * 2 (question + answer) ~= 11,500 image files in the package. I would not mind paying a few extra bucks for these features. It increases the usefulness of the tool and I think it's more fun when you have some numbers rolling on the screen. I hope the publisher takes them into consideration for the next release. Large Package Size: The package size is about 300 MB. Downloading the package might be a problem for folks with slow internet connection. The evaluation copy that I received had a single ZIP file. It would be better to split the file into smaller-sized files. Distributing it on a CD might also be an option (though it would add some S&H cost). Tip: You can overcome the download problem using a tool - Free Download Manager. In fact, the actual package isn't that big. It's simply bloated because there are 3 copies of each flashcard (one in each set). That makes the package three times bigger than what it should be. It's easier to remember the answers when they are listed as bullet points. The font size of the text varies with each card. If the text on the card is less, a larger font size is used to occupy all the available space. I guess it's done for the benefit of people using the tool on the small screens of their iPods and the like. Viewing it on a computer screen, I would prefer to see a fixed font size. You cannot use the shuffle feature of your iPod or other media players. The reason is simple. The card files are laid out in this order - Q1, A1, Q2, A2, Q3, A3 ... and so on. If you shuffle them, the order gets jumbled up and might become Q3, A2, Q20, A5, Q2, A9 ... . I think you can see what I mean. Flashcards are essentially memory aids. For some, they are good-to-have, but for others, they are an absolute must. I know some friends from my school and college, who used to spend hours, rigorously making their own flashcards (using cardboards) before every exam. If you fall in their category, this tool can make your job easy and help you cut down hours from your preparation time. PMP® Exam eFlashCards scores high in terms of content quality, but lacks in terms of application features. Is it a good value for money? Yes. Is it an absolute must-have? No. Would I buy it if I was preparing for the exam? Yes. Should you buy it? You need to think and decide. I hope you find the review useful and it helps you make an informed decision about purchasing this tool. When I click for review, it forwards to the eFlashcard sales page ? I'm confused by your comment. This page (where you have posted the comment) is the review page. Are you looking for more information than this? If you have specific questions, you can either Contact Me or post your comments here.